When you start your vacation by arriving at Waterscape Resort, you’ll want to immediately step onto the white, sandy beach and enjoy the pristine sand between your toes while the cool, crisp ocean breeze swirls around you. You’ll fall immediately in love with Okaloosa Island when you see all that the resort has to offer. At the middle of the resort you will find a beautiful 10,000-square-foot courtyard that you could spend a whole day exploring. Not only will you find many amenities here in the split-level courtyard, you can also relax and gaze out on the beautiful Gulf of Mexico whenever you want. We want to ensure you have the best vacation possible. At Waterscape, you’ll find something to do for everyone in your group. They have two hot tubs for you to use in the courtyard, as well as three different resort-size pools with multiple pool decks to relax on while lounging in the sun. You’ll also enjoy a Lay-Z-River when you just want to float along, and the 10-foot waterfall is a sight to see. But that is not all you will find when you visit Waterscape. For the kids, a pool is offered along with a children’s play area and a splash pad for the kids in your group to socialize on. If you want to cook out, take advantage of the many barbeque pits that are placed in the courtyard, complete with gas grills. At Waterscape Resort, we want you to be able to hold parties and other get-togethers with your family and new-found friends! You don’t have to just stay on the resort to have fun. 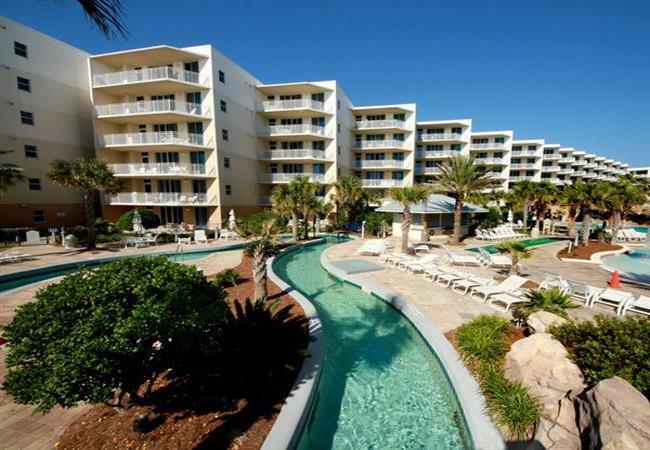 Fort Walton and neighboring Destin offers many activities for you and your family to enjoy. If you take a short stroll from the resort, you will come across the gorgeous Fishing Pier, as well as the Gulfarium of Fort Walton Beach. This aquarium is known as being one of the oldest of its kind throughout the country. In Destin and Fort Walton you can play a round of miniature golf or 18-hole golf, and then shop for souvenirs. Try the fresh, local seafood dinners and ethnic specialties at the many diverse restaurants. If water sports are your thing, take a short drive and enjoy sailing, snorkeling and scuba diving. For the fishermen of the group, deep-sea fishing is also available. Be sure to check out all that Waterscape Resort has to offer. Whether you are vacationing with your family or as a romantic getaway for two, there is something for everyone to enjoy at this beautiful resort. Waterscape’s location is ideal! On Fort Walton Beach’s scenic Okaloosa Island, you are only six miles from downtown Destin. There are several excellent restaurants within a walking distance. Tons of shopping, golf, fishing, and more world-class restaurants are close by. All will enjoy Big Kahuna Water Park, The Track Recreation Center, museums, miniature golf, and more. On the beach, you can go a little wild with nearby parasailing, jet skiing, and wind surfing, or just relax under the beach umbrella with a good book. • Beach Service Included (March-October). • Children’s Splash Pad with Sunken Pirate Ship & Water Toys.